There is something to be said about wreck diving in the north east, about diving in a dry suit, in green and cold water. 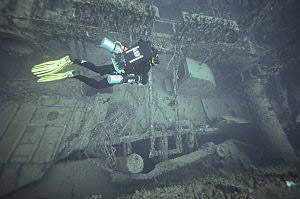 Something to be said about diving wrecks that sank in a storm, a collision or wartime. There is something to be said about the Chester Poling, cut in half in a storm, years after it had sunk. And there is something to be said about great visibility, warm water, wrecks that you can see from the boat, after a 20 minutes trip from the intercoastal. So four of us set off for Florida last week for our own wreck extravaganza. We had booked two days on Captain Oliver’s Avid Diver Charter aiming to hit wreck after wreck around Pompano Beach on our rebreathers (two Dive Rite O2ptimas, one ISC Copis Megalodon and one Ambient Diving Evolution). After that we were going to drive to Key Largo to dive the Spiegel Grove and the Bibb/Duanne. The trip was originally scheduled a month earlier, but bad weather, or a chance at bad weather, at least forced us to cancel. Last week though, we we’re on and the weather looked good, at least a few days before. On Friday morning we were at the dock, loading up our bailout tanks and rebreather rigs, late but happy to be there, impatient to dive and yearning for depth. Sam and I had dove the Sea Emperor earlier that year and we thought it would be a good warmup dive, at 70 feet. And it was. The Sea Emperor is a great and easy wreck; a turtled (upside down) barge which you can swim through from compartment to compartment. A massive green moray and a large Atlantic Stingray played with us throughout the dive getting so close at times that they scared me a little as they brushed past us playfully. After a little while we followed a rock jetty that was supposed to lead us to a second wreck but we never found it, unable to follow the directions that we were given. An hour and thirty minutes after splashing, we were surfacing again. Back at the dock we ate quickly and picked up our friend Howard, an instructor, and Mike, his student, another O2ptima diver I had met during the Bahamas Liveaboard trip earlier that year. Shortly thereafter we were en route to the Rodeo 25, a dutch freighter that was sunk intentionally in 130ft of water. What a dive! Following Captain Oliver’s advice, I found a small opening near the keel which allowed me to get into a dark spot. With my primary light out of commission (never turned on underwater), I relied on my trusty OMS backup light to guide me out of that little chamber. On the other side, the massive engine, the size of a moose which I looked at in amazement for a few minutes. After swimming out of and around the wreck, we found an opening below the wheelhouse into a series of rooms leading to a water bowler, a very nice penetration that made us feel like Christopher Columbus ! While the wreck had been cleaned out before its well attended sinking, it still had the feeling of a ghost ship with wires tangling and electrical closets full of components. After a 92 minutes dive, Sam declared it his best dive ever. He would do this a few more times during the trip. 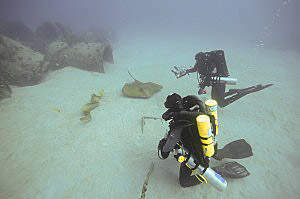 By the time Tom and his dive buddy came back up to the top of the wreck, the hook was gone and each had to pop a bag and do their deco while drifting in the warm Florida waters. While hanging at 20 feet, Tom’s line snapped and he had to pull out his trusty finger spool and pop another bag for the last 15-20 minutes of deco, while we had to figure out why a bag was floating away on its own. Lucky for him, Captain Oliver retrieved his bag, saving him $50 or so. The next day, the plan was to hit the Hydro Atlantic, a ship of huge proportions which sank in a storm in 1987 in 172ft (54m) of water. This was a deeper dive than I ever did, by nearly 30ft (10m). Diving with 21/35 as my diluent, an Aluminum 80 of 21/35 and an Aluminum 40 of EAN50% as bailouts, we had planned the dive carefully and executed our plan. I couldn’t resist bouncing to the sand to look at the bow of the ship towering above me but we spent much of our dive swimming around the perimeter of the wreck then on the deck. A few minutes before it was time to go up (20 minutes into the dive) we checked out the stern and saw a huge Goliath Grouper on the way back, the size of a small Volkswagen, I am not even exaggerating. 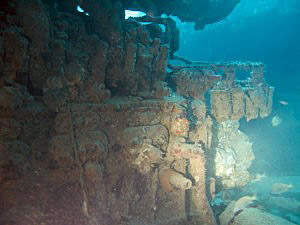 Sam said of this 53 minutes dive that it would have been his best ever had we not spent so much time on the hull of the wreck instead of on the deck. But that’s what happens when you see a wreck for the first time, you’re not really sure which way to go and what to see. Later that afternoon we hit the RSB1 a decent wreck by all counts but lackluster compared to the Hydro Atlantic still so fresh in our minds. After that we did a quick reef dive where I shot the new Dive Rite bag (more on that later) using my new reel. That wrapped two great days of diving in the Pompano Beach region. The next day, we all woke up at 5AM to make our way to SilentWorld Dive Center in Key Largo. Chris has a really good store there, carrying a lot of Halcyon gear as well as some more recreational stuff. He was able to fill our rebreather tanks with O2 and partial-pressure 21/35 which was a god send since I was running low. Despite assurance the previous day that we’d be able to go out, I was nervous that we’d be driving all those miles to get blown out. Once we got to Key Largo things were not looking so good but we were told they’d tried to get us out. Tom and Eric had anti-sea-sickness patches but Sam and I had to run and buy some Bonine (Meclizine) at the local store. Surprisingly the ride to the wreck was quite uneventful and the seas were reasonably calm once we got there. The Silent World IV tied off to the buoy on the bow and we made our descent with almost no current and good visibility. The Spiegel Grove(LSD-32) is an awesome wreck, a former navy ship designed to transport and launch amphibious craft and vehicles with their crews and embarked personnel. Sure it’s been intentionally sunk and could be seen as an amusement park for divers but it’s a gigantic wreck with many items left intact such as lunch tables, ovens, electrical closets; a wreck you can get lost in, a wreck people have died on. The Spiegel Grove is an immense boat loaded with memories for the thousands of navy men and marines who served on it (including one John Mccain). On the first dive Sam and I were able to explore a lot of rooms in the superstructure across four levels, going up, down and sideways but always with some natural light coming in telling us of a nearby exit point. I could do ten dives on the Spiegel Grove and still feel like I’d need to come back. Even though thousands of divers have explored it before me, it felt like I was the first one here as we were penetrating room after room, their floor thickly layered with silt. After over an hour around 95ft (29m), we began our ascent, regretfully, and our decompression. As soon as we were back on the surface, Sam called this dive the best he ever had. Again. We had planned to dive the Duanne and the Bibb in the afternoon but those wrecks being farther out, possibly in the gulf stream which was close to shore that day, we had to ‘resolve’ ourselves to dive the LSD-32 again. This time, Sam and I explored the lower parts of the ship including one of the propellers and the hangar deck. I didn’t feel right during the dive, working a bit more than I should have. Whether I was fatigued, cold or something was really wrong, it doesn’t matter, I quickly called the dive after 30 minutes or so, spent around 125ft (40m). But I had no regrets, I had had the best diving vacation ever. Three days of balls out diving ! That dive concluded our underwater time for that 3 days wreck-athon. While the interpersonal interactions were not at their best during that trip, the diving was stellar. Diving in Florida for our small group of north-eastern divers is becoming a tradition, an escape from our tough conditions between Cape Ann and Cape Cod, an easy way to dive our rebreathers in great conditions, a few hours away from Boston. One thing that makes it very easy for us is the support we get from our local network of rebreather divers. 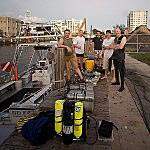 Whether they’re diving with us or not, Adrian, Tim, James and Howard are always here to help, lend us rebreather tanks and bailout cylinders, receive our packages and send us back our gear. We can safely say we wouldn’t be diving that often and that cheaply if it weren’t for them. 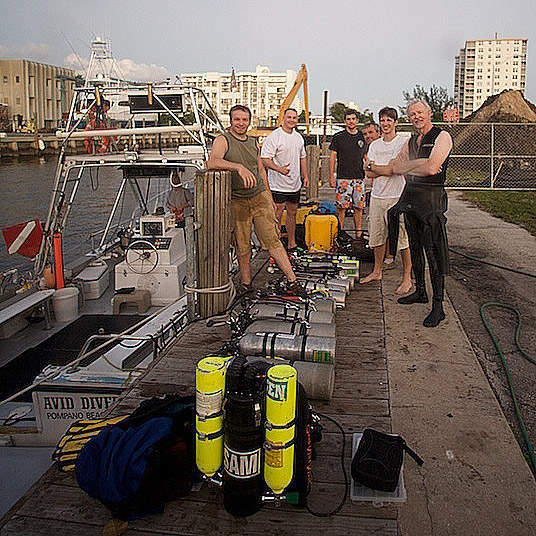 During this trip, we dove on Captain Oliver’s Avid Diver in Pompano Beach and Chris’ Silent World fleet in Key Largo. Avid Diver is a great boat for technical diving; with 4-6 rebreather divers, we had plenty of room to get ready and Oliver dropped us right on top of each wreck without any issues. 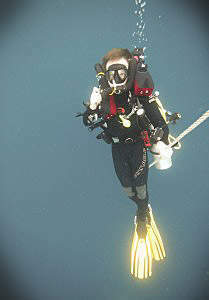 The French-born captain has a lot of technical diving experience and is a great source for advice and local knowledge. Chris’ venture is a little larger with a newfound focus towards technical diving. It’s great to be able to rely on a one stop shop there in Key Largo. He and his team were very helpful and his captains very knowledgeable about the Spiegel Grove. The boats are great, even in rough seas. Local support in Pompano Beach was provided by Ricky, Charles and Tony from Fill Express, simply one of the best shops that I know of. So here you have it, my dive report on our most recent trip. I hope Sam, Tom, Eric, Howard and Mike have the opportunity to chime in. If you want to join us next time, let us know, we’ll be back soon ! Hi Eric, great report. It was good to meet you and Im glad you had a good time. The Spiegel is truly awesome, but we aslo need to get you on the Northern Light (190fsw) or the Queen of Nassau (220fsw) next time. Great photos, I think you are in the quiet room / mess lounge area on the Spiegel. Hope to see you guys down here again soon. This was great diving for all three days! The Hydro Atlantic was my personal favorite. But with a total of over two hours of penetration amongst the Spiegel Grove, this was a close second. 'Extreme'!, Still couldn't find that darn stuffed animal to relocate……..next time. I can't wait for the next warm water adventure. Tiger Sharks in NC, anyone? 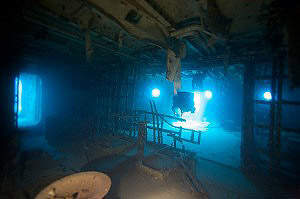 The Spiegel Grove is an excellant wreck to dive. The last time I dove it I wasn't using my CCR and I should have as there is much to explore. That's the draw backs of open circuit diving, so much to see, and so little time. 🙂 Next time my Megalodon goes with me!! Down too long in the midnight sea? Copyright 2008 Erik Dasque and Sam Clemens :: powered by Wordpress and the The Unstandard theme. :: | | 53 queries. 0.373 seconds.